A pyxis is a cylindrical box used for cosmetics. 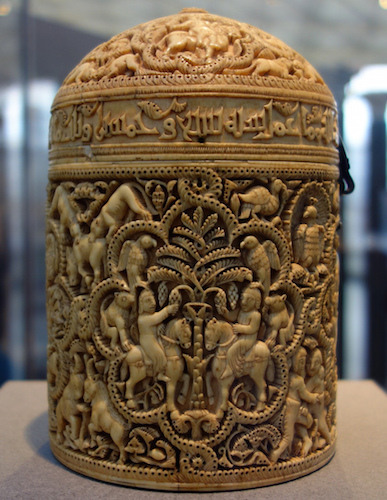 Now, imagine a room in a palace where this beautifully carved ivory container is given a central place. The luxurious box sits open. Inside are small silver containers of perfume, also left open so that their sweet-smelling aromas could waft through the room, gently scenting the air. This particular pyxis was a gift to the then-eighteen-year-old al-Mughira, the son of a caliph, perhaps as a coming-of-age present. Al-Andalus, the lands on the Iberian Peninsula (today, Spain), which were controlled by Muslims from 711 to 1492, are home to some of the most remarkable monuments of Islamic art. These include the Great Mosque of Cordoba, constructed by successive Umayyad Caliphs, and the Alhambra Palace, built by the final Islamic dynasty that controlled Al-Andalus, the Nasrids. As stunning and impressive as the architecture of Al-Andalus was, the luxury arts, specifically the exquisite textiles and intricately carved ivory artifacts, produced in in royal workshops, also flourished. 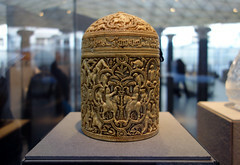 One of the best examples of this tradition is the Pyxis of al-Mughira. Since the twilight years of the Roman Empire, carved ivory objects had been important elements of the artistic canon of the Mediterranean. 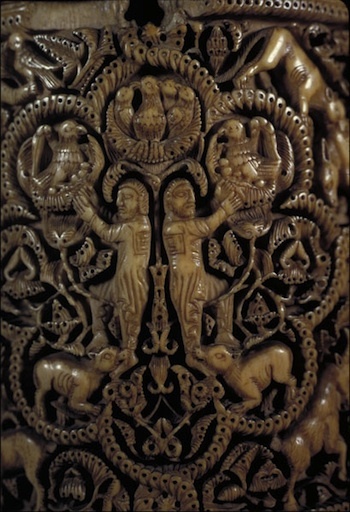 Ivory was durable, smooth, elegant, and easily carved, making it highly desirable for the creation of diptychs, pyxides (the plural of pyxis), and icons that could serve as single panels or could combined into diptychs or triptychs during the Byzantine Empire. Highly portable, they were often given as gifts. 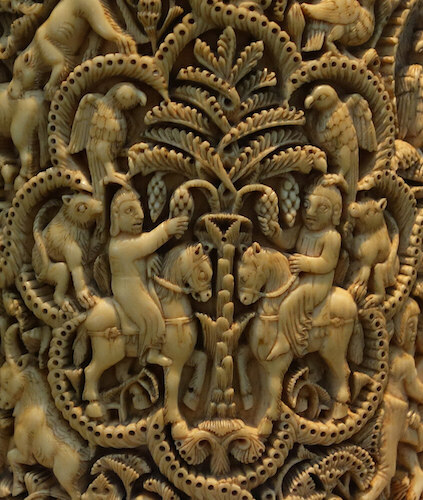 Although ivory carving was practiced in Constantinople, Syria and Egypt, it was a new arrival in Al-Andalus, and there are no examples of ivory carved caskets before the reign of the Umayyad caliph, ‘Abd al-Rahman III (r. 929-61). 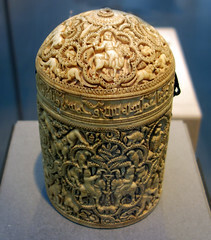 The Pyxis of al-Mughira is decorated with four eight-lobed medallions which are surrounded by figures and animals that include falconers, wrestlers, griffons, peacocks, birds, goats and animals to be hunted. Each medallion has princely iconography. This medallion (left) shows two men collecting eggs from the nests of Falcons, a symbol of Umayyad legitimacy. 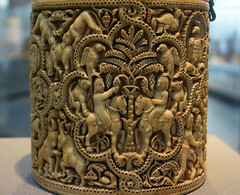 In Al-Andalus, ivory objects, including Pyxides, were bestowed upon members of the royal family, specifically sons, wives and daughters on important or memorable occasions, such as a marriage, birth or coming of age; later they were given as Caliphal gifts to important allies, such as the Berbers, who are the indigenous peoples of North Africa, many of whom converted to Islam and swore their allegiance to the Umayyad Caliphs in Spain. A surprising number of these royal ivory objects survive in their entirety, and these are spread throughout the museum collections today (see the links below). Typically, these objects were carved out of solid ivory. Many caskets and pyxides held perfumes or cosmetics. While many pyxides were given to women, many were also given to men, including this one, which was given to al-Mughira, the youngest son of the deceased caliph ‘Abd al-Raḥmān III, when he was eighteen years old in the year AH 357/ 968 CE. 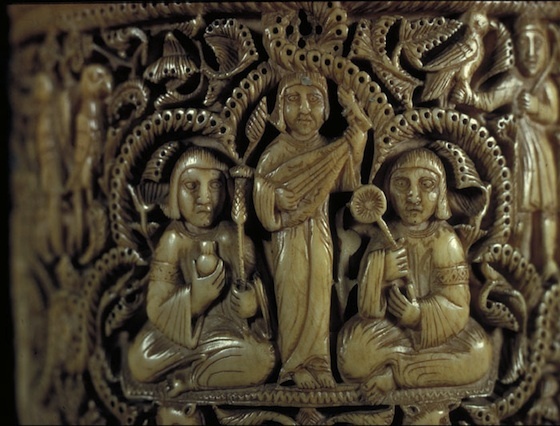 This medallion centers around a lute player flanked by two figures, one of whom holds the braided specter and flask of the Umayyads, while the other holds a fan. Presumably the man with the specter and flask symbolizes the Umayyad Caliph, and the figure with the fan, the Abassids. 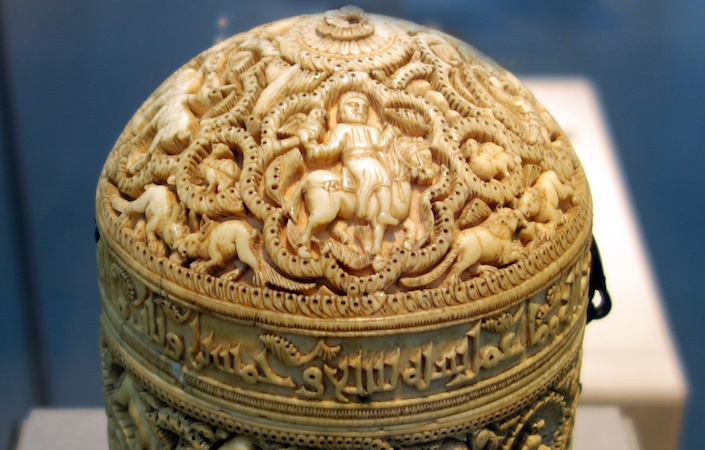 The pyxis was probably cut from the cross-section of an elephant’s tusk and it was adorned in highly specific, royal iconography. There are also traces of inlaid jade. Jade and other precious and semi-precious stones were used in the decoration of these boxes. Remember, Islamic art is not strictly speaking aniconic (aniconic = the absence of human figures). Human and animal figures played a vital part in iconography. 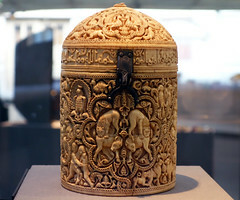 We see them here in this pyxis, which some scholars (including those at the Louvre), have interpreted as expressing the political authority and legitimacy of Umayyad Caliphs (as opposed to the Abbasid Caliphs, who ruled in Baghdad). Another medallion shows lions attacking two bulls. As in Arabic poetry, these lions symbolize the victorious (in this case, perhaps the Umayyads). The final scene shows men on horseback date-picking. The date-palm, found primarily in the Middle East and North Africa, may allude to the lost lands of the East (the lands under Abbasid control). This too was a theme of Umayyad poetry. The use of visual imagery which is also found in the poetry of the era demonstrates that these two art forms were in communication. Some inscriptions on other ivory carvings also mention the name of the workshop and craftsman who made these exceptional pieces. The iconography may have had a further specific message to al-Mughira. After the death of his brother, al-Hakam II, al-Mughira may have been a threat to Hisham II (r. 976-1013) and he was executed (along with his supporters). While al-Mughira met an unfortunate end, the beauty of his pyxis ensured its survival. Bloom, Jonathan, and Sheila Blair. 2009. 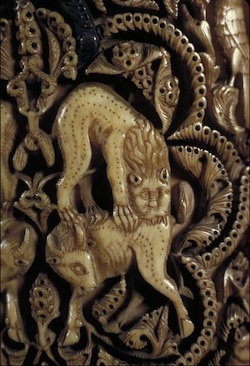 “Ivory.” The Grove encyclopedia of Islamic art and architecture. Oxford: Oxford University Press, 331-6. Rosser-Owen, Mariam. 2010. Islamic arts from Spain. London: V&A Publishing, 26-30. Cite this page as: Dr. Elizabeth Macaulay-Lewis, "Pyxis of al-Mughira," in Smarthistory, August 8, 2015, accessed April 22, 2019, https://smarthistory.org/pyxis-of-al-mughira/.